Taking ‘Thinking like a poet’ to its Logical Conclusion? I’m sure that every reader of this magazine is aware that one of the pitfalls of landscape photography is the tendency to cherry pick the “best locations” repeatedly, the tripod hole mentality if you like. We can appear like a bunch of thrill seekers intent on the next big thing, leaping from subject to subject as if we can’t sit still longer than a 30 second exposure. But there is more to criticise in that approach. What does a one off image no matter how beautiful say to the viewer? Was the photographer just lucky? Easy enough with a digital camera and a big memory card. Are they trying to tell you they’re a great photographer with one image? How much can one image say about the photographer or the subject? You’ve got to admit it’s limiting and if you want to exhibit your work a unifying theme or subject must trump a series of unrelated images. I came to photography via street photographers and a more journalistic style, Cartier-Bresson, Koudelka, Martin Parr and McCullin, people who often have something to say in their photography. I only took landscapes initially to misquote George Mallory “because I was there” and if I’m honest because I felt it was something I really wasn’t any good at. It was something I wanted to develop and after the initial amazement at looking at other’s work and producing my own “wows” I found emptiness at the heart of one off landscape photography. So what is the alternative to leaping about like demented fleas upon the landscape? For many landscape photographers it is the project, either based around a specific area, subject or theme. I’m a big advocate for working on projects they add not just breadth, but depth. A series of images should also lend a more powerful appreciation of what the photographer has to say. More is sometimes more! They allow the viewer to spend more time looking at the work and crucially to make links between images, meaning they are engaging their mind as well as their eyes, surely a more satisfying experience? I don’t care for mere surface shallowness and I firmly believe that the interaction between thought and image can add something deeper to the experience of viewing. We are after all not just viewing machines designed to gobble up satisfying images, but come with a brain attached that questions, interacts - memories are sparked and associations are made whether we desire it or not. The best photography (and art) captures something that has a meaning beyond the image itself; it sparks a chord within us. The inspiration behind Skirrid Hill? Projects can be elusive, so many people tell me they want to follow a more project-based style of photography, but they just don’t know where to start or what to choose. I hope to be able to share some of my experiences on both my new Skirrid Hill project and some insights from previous projects as a route through the soup of those distractions that prevent us ever starting. I guess you have to be at a certain level of maturity in your photography before you start a project, to have learned what you need to about technique and process and have learned how they can be bent to communicate something more. But having said that I was working in a project based manner long before I realised the art potential, that something more that connections can make. Projects for me share three key features, they are personal, they are restrictive either through subject, area, style and or theme and finally I am passionate about them, or why bother! Cobbling that lot together probably looks a bit daunting, but in truth one tends to inform the other. So for example in Memories, Dreams and Reflections I wanted to explore the area around Abergavenny where I spent many of my holidays with my maternal grandparents, that was the place sorted. Analysing my feelings about it – I was grieving the death of my mother and my memories of the past were pretty vague as I hadn’t been there for over 20 years informed the style and theme. I decided the best way to convey the vagueness of that memory was to use intentional camera movement (ICM), sharp bright landscapes would have been completely wrong. Ironically I started off using monochrome for the first three images, before switching to colour when I realised the muted palette of late winter tones were ideal for both relating the mood and to the idea of sparking memories by association. If you’re still photographing orange sunsets and haven’t figured out that if orange were so great why isn’t being stuck on Easyjet not more fun? Then a project is going to be a big leap. That the constant exposure to bright cheerful colours doesn’t bring joy, but makes us suspicious of being sold a lie. Even supermarkets are starting to realise people believe subtle more than having the message poked into their eyes. My route around the barrier of finding a more meaningful portrayal within the landscape has been to work in a conceptual manner, developing ideas as a sort of backstory to find what I am trying to convey and to concentrate the mind when confronted by the overwhelming wealth the landscape presents us with. 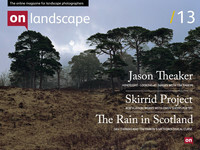 In Memories, Dreams and Reflections it was a cathartic response to the death of a loved one, revisiting our childhood haunts and in Tree Line a journey towards the light so to speak – a far more celebratory view of the joys of landscape, but tempered with some of that previous darkness. These were very personal pieces, the effort of both the emotional responses required and the construction of the ideas behind them was burdensome to say the least, but more positively also cathartic and releasing. Both the previous projects were taken on the lower slopes of a not quite mountain known as the Sugar Loaf near Abergavenny. When I discovered Owen Sheers’ book of poetry Skirrid Hill was based literally on the next hill east and another of my childhood haunts I became intrigued. This one would be different however; I was going to be more of a director, interpreting the words for the viewer. In many ways that has proved to be a blessing – it is less intrinsically personal, but also the knowledge of working from a personal response gave me the strength to take the project a step further into the territory of art. How to develop the ideas? I find I have a need for complexity in my project ideas. Complexity helps avoid the formulaic, it helps originality and it helps avoid the banal. I usually start a project with a visit to the place, sometimes with a camera and sometimes without, just as an exploratory trip, a way of analysing the place. It’s important to understand that images can be the start of informing your ideas, so exploring with the camera is as valid as just looking. But I tend to resort to words to generate more clarity and more depth about how I feel and what I want to represent in a given project. I’ll usually start with a pen and paper and make lists of keywords about my feelings, the history of the place and my associations with it. I’ll also make a quick list of images to avoid, the cliché of the lone tree was chief amongst my Tree Line avoidances. This means not only are we producing work that is different, but it also means that we have to think creatively, not relying on the memories of how something was approached by others in the past, but having to look inside ourselves to find a way of expressing our ideas. Skirrid Hill was different because I already had somebody else’s ideas on a page before me. But before I even got to Sheer’s poetry the book gave two clues as to how to proceed. Firstly the introduction includes an analysis of the name Skirrid Hill. It is an Anglicisation of the Welsh Ysgyrid Fawr. Fawr simply means hill or larger, there is a little Skirrid too) and Ysgyrid is a derivation of the Welsh Ysgariad meaning divorce or separation. They are a central theme within the poetry, but reading around the subject and some local knowledge also revealed that by local legend the landslip that creates a cleft on the northwest side of the hill and is a key feature of the hill when seen from a distance supposedly happened at the time of the Crucifixion. There is also an introductory quote from T.S. Eliot’s East Coker that was important for both the poetry and my visual interpretation. My initial idea was to follow in the footsteps of Fay Godwin and Ted Hughes in the remarkable collaboration The Remains of Elmet, but I soon found two flaws in that idea. Firstly, I was always dissatisfied in the relationship between words and images in Elmet, not that either lacked beauty in themselves, but that Godwin’s work was essentially an illustration of place designed to illuminate the text rather than being in more directly inspired by the wonderful words of Hughes. Secondly on reading Owen Sheers’ words it quickly became apparent to me that this was a far deeper and more emotive work than a book of poetry about a small hill on the borders of Wales. The Skirrid is there as a centre-point, it is an anchor to the experiences of life recounted in the poems, from the death of his mother, to his relationship with his father, his lovers and lost lovers and experiences of life and growing up in a small market town. Faced with these two problems and determined that it should remain a landscape photography project the only way to find a solution to these problems was to literally find a poetic interpretation in the images I produced. Something vaguer and more abstracted, something more akin to art itself, but that could be seen as both interacting with and inspired by the poetry. Where possible I would still produce more literal photographs, a sense of place is important to both the poetry and to myself and as far as possible I would keep to the Skirrid or other nearby locations found within the words. But also those poems that represent a more personal and emotive life experience would give me the opportunity to explore more deeply the ideas contained within and express them through elements found within the landscape itself in a manner perhaps of something vaguely magic realist, perhaps as in the Eliot quote ‘stranger, the pattern more complicated’. Problems are the route of creativity, they engage our brains and force us to make new connections, to see afresh and find new ideas. So without problems we wouldn’t ever create new work. Obviously the project approach creates it’s own problems, how to hold a style and keep to a theme over a long period of time is one. Funnily enough I find writing about my projects helps, just as I have done here! finding at last, something huge enough to blame. The seasonality of some of the poems may well slow the rate of progress, I’m finding myself bypassed by the seasons before I can find a suitable image, so I suspect I am looking at years before completion, not weeks or months and in that respect will significantly differ from my previous projects. I’m also interested in John Berger’s ideas about seeing images in series, about how the force of multiples reinforces the potency of individual images and how I can develop a visual relationship within the images – a series of refrains - as Chris Tancock would put it. The idea that there can be a visual link between them, so like him I’m now carrying the images I’ve made so far on my iPod so that I can use them as a reference when producing new work, and I can find the link between and within. Please click on individual images to reveal the text that inspired them.